This game was full of the fiercest competition! Not against the other team, they weren’t really good enough to compete against. I was in competition for the title of “Most Kills” with Jake. The picture is below, so the secret will be out very quickly that I won, but there was a time in this game where I figured I was going to lose. Jake was steam-rolling top lane. Bot wasn’t even showing up to lane, so I had nothing to kill but creeps. Now, don’t get me wrong, I love me some creeps, but they only help me win the competition by giving me money which makes me get items which makes me do more damage later. I told myself that as long as I was the one with most gold at the end of the game I would consider it a personal victory. Then Ketsuyume happened. He was the sleeper. When he was 0-2 he wrote in all-chat “Ok, I’m not dying again this game!” and I groaned. Out loud. On Skype. Don’t make ridiculous bold statements like that! It just entices the enemy that you’ve fed all game to kill you some more! 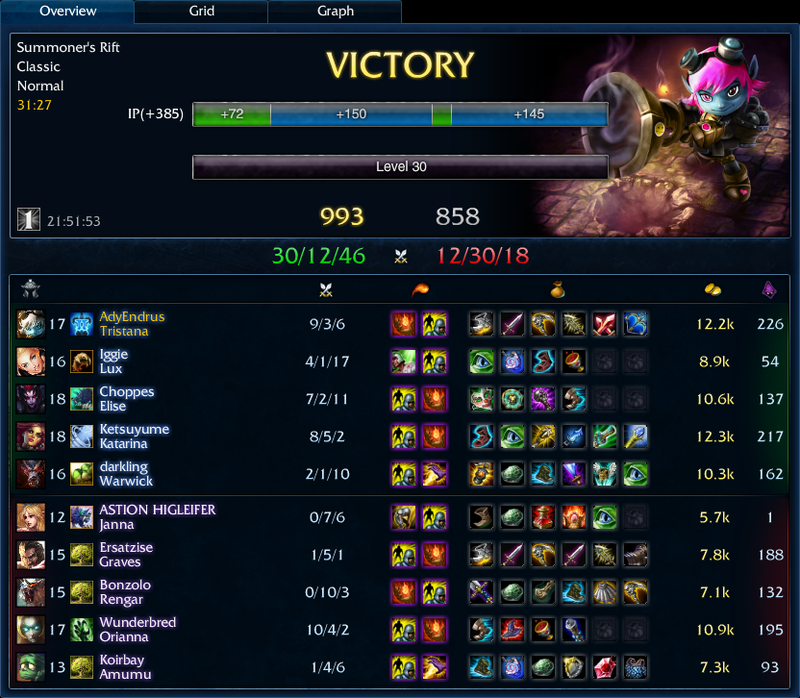 The champion he played against mid had 10 of the enemy team’s 12 kills and was tied for fewest deaths. Yet the silly mechanic that is Katarina’s passive allowed her to get back into the game. If he could have mashed buttons faster he probably could have had a quadra kill. It was still a lovely clean-up to the team fight that started out poorly for us. Even though I won the title of “Most Kills” I managed to lose the personal goal of most gold. It was probably that one time that I didn’t get the last hit on dragon. Or when I missed out on First Blood. Sure, I got assist credit, but what good is assist credit when I could get 400 sweet gold for kill credit!